The Winster Guisers perform at various venues around the White peak villages of Derbyshire throughout the Christmas period bringing a traditional mix of colourful drama and festive cheer to an unsuspecting public. Guising is a local tradition better known around England as Mumming. The dictionary tells us that a ‘mummer’ is one who ‘masquerades’ in a folk play usually at Christmas whilst a ’Guiser’ is a person in disguise. 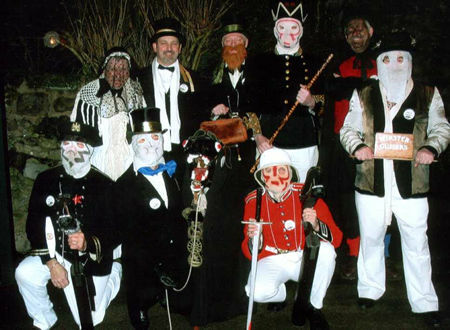 The seasonal round of English life was once marked by ceremonials and rites performed by men wearing disguises, and though the origins of ‘guising’ are uncertain and differ from place to place, they may be connected to pre-Christian, possibly even Celtic fertility rituals. The Winster tradition, characters and costumes are based upon a photograph taken outside Winster Hall in C1870. This is the oldest existing photographic record of the mumming/guising tradition in the world today. The antiquarian Llewellyn Jewitt, then owner of the Hall, wrote and described the various ‘troupes’ of Guisers who visited over Xmas in the late 1860’s. Indeed the custom of Guising was well established in numerous Peakland villages until the Great War, and even survived in some until the 1940’s. It was, however, lost in Winster until revived in 1980 and the Winster Guisers are still going strong today. The characters enter as follows, the Enterer-in, dressed in formal attire, sets that stage for the ‘conflict’ between St. George, a noble champion dressed in Red and riding a hobby Horse, and the Black Prince of Paradise. St George is victorious and the King of Egypt then berates him for killing his son. An old woman then calls for a doctor and a Quack Doctor enters with his potions to cure the dead prince. This is done by ‘uplifting’ a pint of beer from a member of the audience and is drunk in one swallow by the prone prince. A departure from the narrative now occurs as a devilish Beelzebub enters followed by Little Johnny Jack, with his wife and family on his back, and then Little Devilly Doubt. The climax of the ‘show’ is the appearance of the Groom and the Horse, a real horse’s head operated by a concealed Guiser, who captivates with his antics. A final song rounds off the performance and a welcoming beer is then supped by all to bring good luck to all those present. Over the last quarter of a century the Guisers have become well known and liked visiting traditional hostelries and houses on a regular basis. Refreshment is taken to bring ‘good luck’ to the hosts and a collection is taken for Charity. Many thousands of pounds have been raised and all monies are distributed locally to causes such as Mencap, Age Concern, Crossroads, Weston Park as well as more specifically to Winster groups such as Darby & Joan, Winster Primary School etc. Many of the original Guisers are still performing today if showing a little wear and tear but I’m sure they will ‘battle on’ for some time yet.